Oils, pills, and vapors will be available only to patients suffering from severe conditions. ST. PAUL — There will be no baggies of pot awaiting patients next week when Minnesota joins 21 other states in offering medical marijuana. No glass pipes, no plants to tend at home. Instead, the nation’s latest medical marijuana program is a world of pill bottles and vials of marijuana-infused oil. For the qualifying patients seeking relief from pain, medical marijuana advocates, and some lawmakers, Wednesday isn’t the finish line, but the first step. The state’s restrictive approach, unseen in the industry, is likely to mean high costs, long drives, and reluctant doctors. Smoking the plant is forbidden. Pills, oils, and vapors are only available to patients suffering from severe conditions, such as cancer, epilepsy, HIV, and AIDS. And the medicine can only be sold in eight locations, hundreds of miles away from some in Minnesota’s rural expanses. 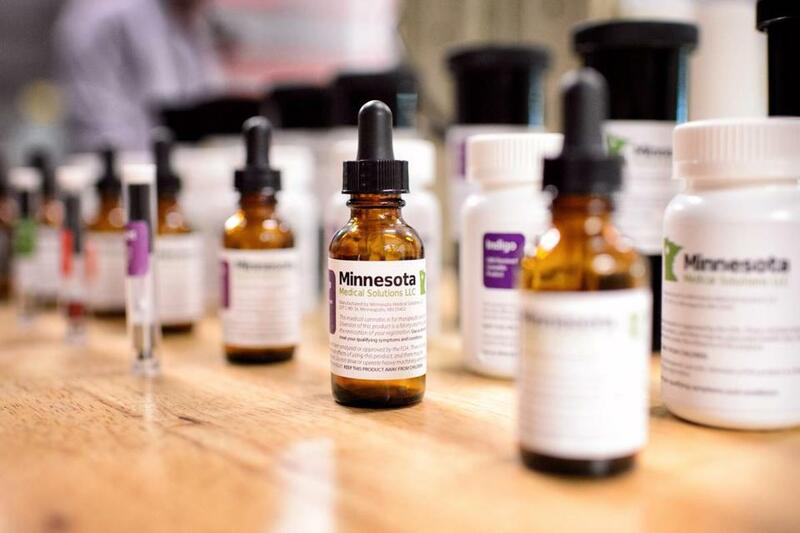 The two companies growing, cultivating and selling marijuana for the state say Minnesota stands out for its medical approach to a nearly 20-year-old industry that uses terms like ‘‘budtender’’ (salesmen) and ‘‘California Kush’’ (a strain of marijuana). Kathy Schroeder’s difficult path shows how the medical polishes on Minnesota’s program look more like hurdles to some patients. On paper, her multiple sclerosis and glaucoma — two of the nine conditions that qualify — made her a perfect fit. But like many residents, the 63-year-old struggled to get a doctor’s signature to sign up for the program. Prodding a second doctor paid off for her, but Schroeder isn’t sure whether she can even afford a month’s worth of medicine, which Kinglsey said may sell for up to $600. Still, she'll make the 180-mile round trip Wednesday from her home near Rochester to MinnMed’s Minneapolis facility. ‘‘I knew it was going to be bad, I had no idea it was going to be this bad,’’ her daughter, Maren Schroeder, said. Representative Carly Melin sympathizes. The Democrat faced criticism for watering down her medical marijuana bill to get police and Governor Mark Dayton on board. ‘‘We weren’t going to get anything done if we didn’t pass this law,’’ Melin said. But before expanding, Dr. Andrew Bachman, co-founder of the state’s other medical marijuana manufacturer, LeafLine Labs, said they need time to show lawmakers and doctors alike that the new industry works. ‘‘Ideology does not change overnight. It’s important to start somewhere,’’ he said.